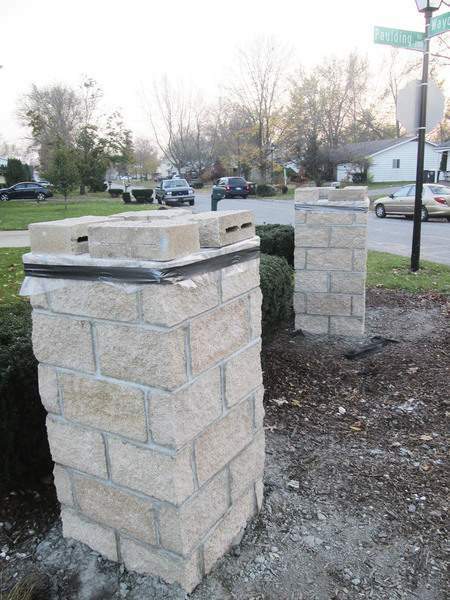 Frank Gray | The Journal Gazette New pillars mark the entrance to the Continental Park neighborhood off Paulding Road, thanks to donated supplies and work arranged by the new president of the neighborhood association. The Continental Park neighborhood association has only 67 houses, so even if everyone in the community gets involved, they lack the heft to raise a lot of money or pursue big projects that neighborhoods with hundreds of homes can. So when Jesse Jackson and his wife, Flora, became president and vice president of the association a few months ago, they were at a distinct disadvantage. They knew where to start. The brick pillars that marked the entrance to the neighborhood, near Paulding and Hessen Cassel roads, were decades old and falling apart. Repairing them, though, was tricky. "We didn’t have the funds to do anything," Jesse Jackson said. Jackson thought he could just tuck-point them, reinserting mortar here and there. But when people who knew what they were doing inspected them, he learned he was wrong. The pillars were beyond repair. So Jackson spent a little time each day before work hammering away at the pillars with a sledgehammer, tearing them down. Jackson’s labor was free, but the association had no money at all for bricks and rebuilding the pillars. So Jackson started knocking on doors, and it worked. Masolite donated bricks. Parker Towing agreed to deliver them. Young’s Flowers donated some shrubbery. Lowe’s kicked in a little. The bricklayers union agreed to rebuild the pillars, using the project as training for students. All Jackson had to supply was the mortar. "A lot of doors were closed, but God opens other ones," Jackson said. This morning, Jackson and members of the union will install the capstones on the pillars. The first project will be complete. The real goal, though, is to turn Continental from a neighborhood into a community, Jackson says. "I’m trying to have a neighborhood where we are friends, not just neighbors," Jackson says. "I’m trying to get programs in place so people can upgrade their homes," he said. "Like no student left behind, no home left behind." People are willing and waiting to help, Jackson says, but the neighborhood association has to be the one to implement. "We’re working toward getting people involved," he said. "If people get more involved, let them see what they can accomplish." Getting people to show up at association meetings is one of Jackson’s goals. Association meetings aren’t just for the president, vice president and secretary; they’re for everybody in the association, he says. "It’s not my community, it’s their community," says. "We have to get all hands on deck. There are people who need help. Our job is to get people to come to the meetings." The city, he says, has programs designed to help people with their homes. It’s the association’s job to keep residents informed. Meanwhile, the first thing people see when they enter the neighborhood will be those new entryways.